Thousands of people attended President-elect Donald Trump’s “Thank You” rally in Des Moines, Iowa on Thursday night, where the soon-to-be 45th President of the United States introduced his administration’s ambassador to China, Iowa Gov. Terry Branstad. Trump told the crowd of more than 5,000 people, according to the Des Moines Register’s Jason Noble, that one of the most important relationships that the United States must improve is with China. During the 2016 campaign, Trump continuously criticized China for currency manipulation. Branstad has had six trade missions to China. He’s a native of Iowa and has served as the state’s governor for 23 years, making him the longest serving governor in the history of the United States. 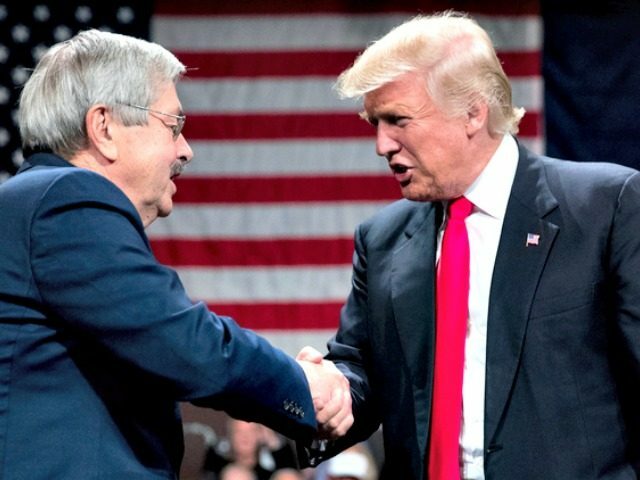 “He’s also become a great friend of mine,” Trump added before inviting Branstad on stage with him. Anti-Trump protesters interrupted the President-elect, but were quickly escorted out of the event. “That’s ok…I think they’re actually on our side, they just don’t know it yet,” Trump said in response to the interruption.